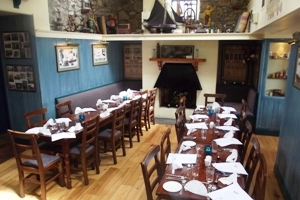 Donnelly’s of Barna is an old established licensed landmark, and now one of Galway’s finest seafood restaurants. Located just a short journey from Galway City on the picturesque coastal route to Connemara, this charming bar & restaurant is synonymous with catering, tradition and the true spirit of Ireland. The entire premises are cast in the traditional old-world idiom with stone, brick and wood giving a nostalgic authenticity to the character of Donnelly’s. The bar has a series of intimate nooks varying in size where the visitor can relax, have a quiet drink, mingle with the locals or enjoy a gourmet meal. In addition to the usual symphony of international dishes Donnelly’s specialise in locally caught seafood. The restaurant has a slightly more formal layout with parallel standards of quality, service and atmosphere. In addition to the usual symphony of International dishes Donnelly’s specialise in locally caught seafood – plaice, scallops, crab claws etc. The gastronomic delights are all freshly prepared and presented with a flair and imagination worthy of the most discerning palate. This award winning dining and drinks emporium is a leading gourmet attraction with a unique atmospheric presence where par-excellence applies to all aspects of its modus-operandi. 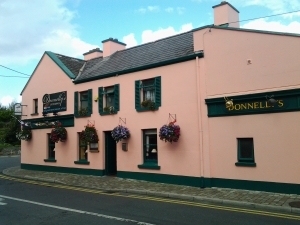 If you’re searching for a Pub experience that will have great services and facilities for visitors, you’ll be glad to know that Donnellys Of Barna is quality assured by Fáilte Ireland.